The Mazda 929 (also sold as the Efini MS-9) was originally a mid-size car from 1973-1987 and as a full-size car thereafter. Marketed over three decades, the 929 sometimes shared its chassis with the rotary Mazda Luce. It has always been a front engined, rear wheel drive vehicle. 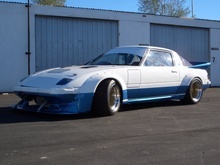 The first Mazda 929 was introduced in 1973 to replace the piston-powered Mazda Luce, which had become the rotary RX-4. It was a large (for Japan) coupe, sedan, and station wagon powered by a 1.8 L (1769 cc) inline-4 Mazda VB engine. Output was 94 hp (69 kW) and 101 N·m (137 N·m). The Luce was updated in 1975 with an optional 2.0 L (1970 cc) engine which produced 103 hp (76 kW) and 123 N·m (167 N·m) from a 2 barrel carburetor. Another option was the 13B rotary engine, producing 127 hp (93 kW) and 138 N·m (188 N·m). A more efficient 2.0 L I4, producing 90 hp (66 kW) with a single-barrel carb, was added in 1977. The final addition was a 2.2 L Diesel engine for 1980. Its output was 66 hp (49 kW) and 104 N·m (142 N·m). The 929 was replaced after 1979 by the next generation Luce/929. 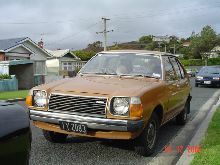 The next generation 929 was introduced in 1981, remaining an export version of the Mazda Luce. It was a large front-engine rear-wheel drive sedan or estate car on the new HB platform with the Mazda Cosmo. This version was introduced in 1982 in some markets and produced until 1986, though Japan got a new Luce a year earlier. 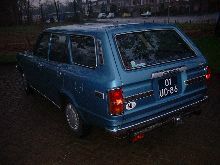 In Europe the 929 was badged 2000 or 2000E (E denoting "estate car"). The turbo version was never offered in Europe, neither was the saloon (although parts of Europe bordering on Eastern Europe and the Middle East received the saloon version. Cyprus got both the sedan and estate car versions. The 929 was updated in 1986 (1987 in some markets) with the HC platform and a 3.0 Liter V6 engine. The car was produced through 1991, again lagging behind its Japan-market twin, the Mazda Luce, by one year. The 929 began U.S. and Canadian sales in 1988; the only engine option was the 3.0 Liter V6. After 1990, when Chrysler dropped its Fifth Avenue and Dodge Diplomat (both of which had 318 cubic inch V8 engines) it would exclusively rival the Toyota Cressida until Toyota dropped the car after 1992. The Canadian 929 came with a 'Winter Package' option and included heated seats, a higher grade alternator, winter tires and non-recessed windshield wipers. A five-speed manual gearbox was an option, but most North American 929s were two-mode ('power' and 'economy') electronic 4-speed automatics. Top speed was 121 mph (195 km/h). A 0-60 mph time of 9.2 seconds was recorded using the manual gearbox; the automatics were somewhat slower at 10 seconds. The HC platform came out in two variations during its five year span that had identical engines and interior but with two distinct body shapes; a pillared four-door sedan as well as a slightly larger pillarless four-door Hardtop. While the pillared model was common in all countries that allowed the importation of the 929 (including the US and Canada), the pillarless model was predominantly seen in the Russian, Asian, and Australian markets. The Luce Royal Classic (and lesser-spec Limited) was more expensive than its 929 counterpart, featuring greater technical innovation — both were pillarless hardtops. The Royal Classic could be factory fitted with a 13B Rotary or a 2.0 Litre V6 turbo engine, electric leather seats, digital speedometer, a cool-box for canned beverages, prominent emblems, electronically adjustable suspension and power options throughout. The first 3.0 Litre V6 engine seen in the 1986-1989 929 was a Single Overhead Cam type with 18 valves. When Mazda released the higher-spec 929S model for the 1990-1991 period, the engine was upgraded to a Double Overhead Cam type with 24 valves, slightly increasing fuel economy, performance and reliability. Also in the revised edition came the presence of an anti-lock braking system, ventilated rear disc brakes and a few inconspicuous changes to the exterior. The standard 18 valve SOHC remained in the base model 929. The HD generation of the 929 appeared in 1990, with the smaller four cylinder engines dropped in favour of V6 engines only. It was sold as the Efini MS-9 under Mazda's ill-fated diversification plan. There was no longer a Luce rotary version, and the Cosmo got a new platform as well. A new model, the Sentia, appeared on the same platform. In Canada, the car was known as the 929 Serenia. 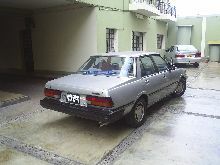 The Mazda 929 was available with ABS, full electrics, cruise, 4WS, 4WD (in some markets), as well as a 'solar vent' that vents the heat from the car. The Sentia continued for one more generation, but importation of the 929 to North America stopped in 1995 with the front-wheel drive Mazda Millenia remaining at the top of the company's lineup. The 929 was withdrawn from North America due to a lack of competition at the Japanese import level, since the Toyota Cressida ended production in 1992. For North America, it was the last remaining mainstream rear-wheel drive sedan with a V6 engine, though smoother straight-six designs continued in European cars until the Chrysler 300 was unveiled in 2005. During the early 1990s Mazda had considered introducing its own luxury brand, Amati, to compete with Lexus, Infiniti and Acura but later withdrew their plans. 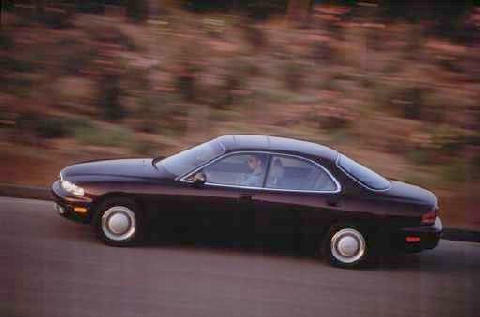 The 929 was replaced by the Mazda Millenia as the flagship sedan. The final HE generation of the 929 appeared in April 1996. The engine remained a carry-over, and the dimensions of the vehicle were identical to the previous model. Production remained short; exports were halted in 1997 due to poor sales and an increasingly high price tag (in its final year the 929's price had increased to over $83,000 in the Australian market - about the same price as an entry-level BMW 5-Series).